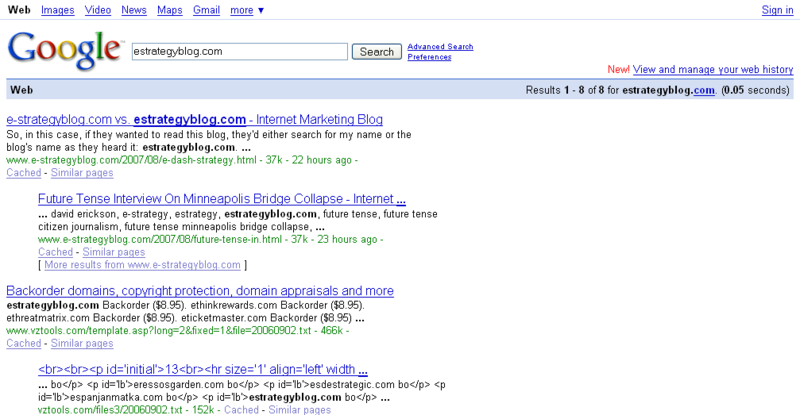 Last Tuesday I discussed a domain name problem I ran into after I was interviewed for Future Tense about the Minneapolis bridge collapse and they omitted the hyphen from this blog’s address when they cited it on air: They said estrategyblog.com rather that e dash strategy blog dot com. Because I had not yet bought the hyphenless version of the domain, I stood to lose some very targeted and valuable traffic to my blog as a result of the interview. 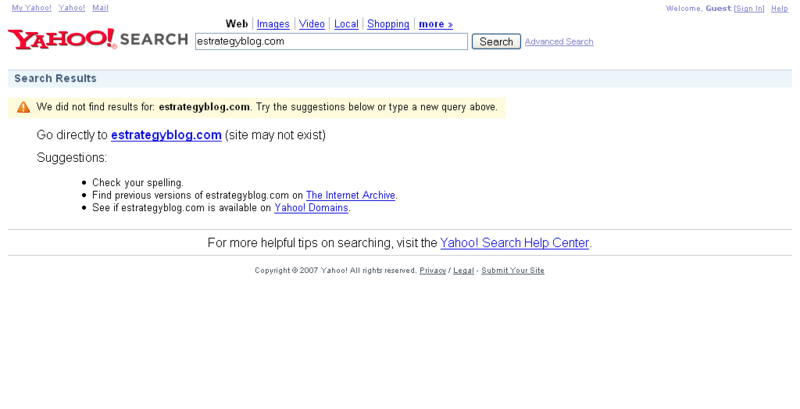 Consequently, I had to scramble to buy estrategyblog.com, forward it to e-strategy.com, and write a blog post seeded with "estrategyblog.com" on the assumption that radio listeners would use that as a search phrase if they wanted to find my blog after hearing the interview. 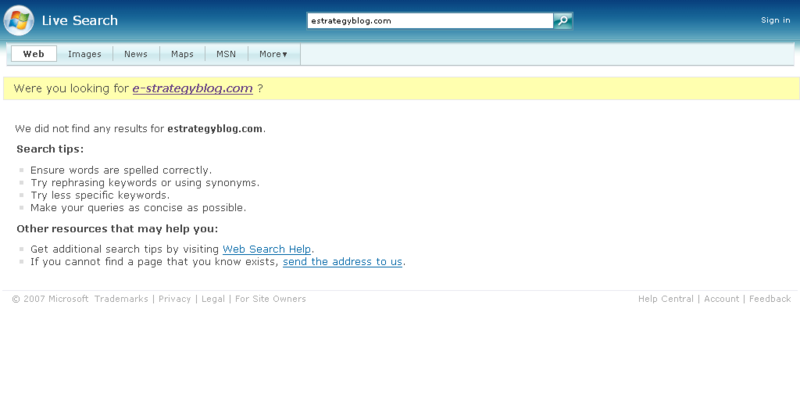 Since Tuesday, this blog had seven visitors who found it using "estrategyblog.com" as a search phrase. Those visits had a bounce rate of 25.57% and the average time on site was 12:57, which says that the information on the blog matched what they expected to find and was compelling enough for them to stick around and read it. 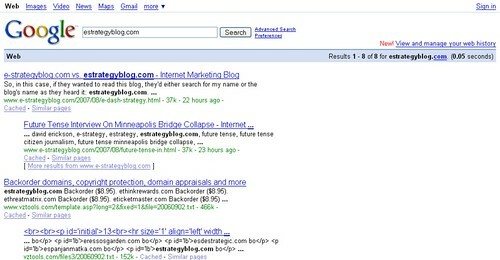 Further, those visitors averaged 2.43 page views, so they were interested enough in the overall blog rather than just that specific post, making them prime candidates for becoming regular readers. While seven visitors is obviously a tiny, tiny sliver of my overall traffic, because I know they came to my blog after hearing the interview on Future Tense, they are highly qualified visitors. Future Tense is a self-described "journal of the digital age" so I know that it’s listeners are interested in technology. Because of the topic of my interview, I know these visitors are interested in Internet technology in particular and social media specifically. That adds up to make them highly likely to like the topics I address in this blog. The other thing to consider is that the interview is likely to have a very long afterlife, the proverbial long tail. Future Tense distributes each episode as a podcast, as well, so they are not just being consumed over the airwaves. They post a summary on the Future Tense site for each episode that includes the MP3 file of the episode, a Real Audio stream of it, and a link to the episode in iTunes. Not only are existing Future Tense podcast subscribers going to hear the episode but anyone coming to that post about the episode can listen to it as well. And because there’s a downloadable MP3 file of the episode there, the episode could end up anywhere online. People will often listen to their podcasts at their leisure, not necessarily the day of, or even the week of, the original broadcast. 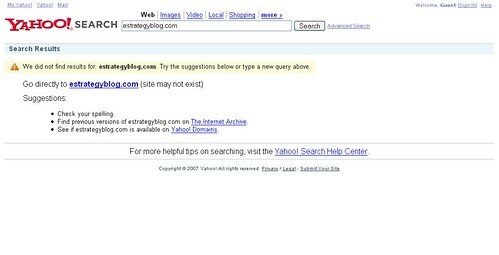 I would not be surprised to find people searching for "estrategyblog.com" a year from now after people found and just finished listening to that particular episode on the web somewhere. Or, in the event of another disaster, it’s entirely possible that this episode of Future Tense will get referred to and I could consequently see a spike in traffic as a result.